In recent weeks, San Francisco has seen corporate and development interests move to make Mission Bay a hub for biotechnology, Rincon Hill a refuge for wealthy condo owners, and Mid-Market a radically-transformed home for upscale residential and office development. Voters never approved this dramatic reshaping of San Francisco, and this agenda did not emerge out of any public hearing process. Instead, while activists are given three minutes to shape policy by speaking at public hearings, the city’s elite is making backroom decisions regarding who will live and work in San Francisco that threaten progressive politics in District 6 and all of San Francisco. In March 2004, San Francisco voters rejected by a 70-30 margin a ballot initiative (Prop J) backed by Mayor Newsom and the Chamber of Commerce that sought to bring highrise condominium development to the downtown and adjacent areas. One year later, the chief objectives of Prop J have been met despite the electorate’s rejection of this agenda at the ballot box. How did this happen? Were there some hearings we all missed in which our elected officials pushed to create thousands of new luxury condominiums in the neighborhoods adjacent to downtown? Such hearings did not occur. Instead, downtown forces responded to the landslide defeat of Prop J by pursuing the same agenda by more subtle means, relying on strategies that made it difficult if not near impossible for public input to restrict their plans. Consider the virtually overnight transformation of Mission Bay into the Bay Area “hub” for stem cell research, a land use decision designed to bring even more upscale buyers into the city’s already mind-bogglingly expensive homeownership market. Whether most San Franciscans even want another dot-com type boom that will raise home prices and rents is beside the point. The team of unelected elites headed by GAP founder and multimillionaire Republican Donald Fisher want San Francisco to be the center for biotech, and they put together the $17 million benefit package that brought the stem cell headquarters to San Francisco. Significantly, the Board of Supervisors did not have to approve the Mayor’s use of this rich financial package. The Mayor is apparently free to leverage whatever private resources for whatever public purpose that he chooses, without any public debate over priorities. Because the negotiations around the $17 million package were done in secret—no Sunshine or Brown Act problems here—one can only imagine what Mayor Newsom has privately agreed to in exchange for securing these benefits. Was his recent announcement of a police crackdown on homeless persons in Union Square part of the deal? Or was the tourist industry’s generous donations to the package a thank you to the Mayor for continuing to allocate millions in public funds to the Convention and Visitors Bureau? There’s no way to know. But one thing we do know is that had Mayor Willie Brown asked people with major business interests in the city to donate $17 million, the media would be full of questions of what he promised to do for them in return. In Mayor Newsom’s case, such packaging of corporate benefits is lauded as part of his entrepreneurial spirit. As part of his quest for high-paying biotech jobs, Mayor Newsom highlighted the huge number of housing units that the city has slated to house new upscale residents. Many of these units will be created in Rincon Hill, whose transformation into a haven for luxury condos emerged in the backrooms without any meaningful public input or endorsement. Despite the voters overwhelming rejection of Prop J’s push for more highrise condos, that’s exactly what we will see in Rincon Hill. While the public and San Francisco politicians argue that affordable housing is the city’s priority, development interests have secured a potentially wonderful waterfront area for the near exclusive use of people who do not currently live in San Francisco and who can afford homes starting at $1 million. Because few people live next door to the 40-55 story buildings soon to be built in Rincon, opposition to the neighborhood’s transformation came too late. Cheered on by the Chronicle’s insistence that these view-blocking towers priced as second-homes for foreign investors will nevertheless create a “dynamic new neighborhood,” the Planning Commission did not hesitate to speak and vote in favor of the Rincon Area Plan. One reason for the lack of mass public protest regarding Rincon is that it is not seen as in any neighborhood’s “backyard.” The Board of Supervisors sees the creation of yet another wealthy white enclave in the city as a fait accompli, with the only remaining issue whether Supervisor Daly will get anything for SOMA residents in mitigation funds. The difference in scope between elite and neighborhood power in San Francisco is demonstrated by the conflicting approaches to Rincon Hill and a 14 unit building proposed a few years ago at Dolores and 29th Streets. At Rincon, developers were given free rein to remake and transform an entire neighborhood. Although the soon to be built towers will block views of the city’s waterfront and skyline, the Planning Commission’s consideration of the Rincon area plan took relatively little time. In contrast, the full Board of Supervisors spent seven hours debating whether there could be a fourth floor on the Dolores Street project. Neighbors seeking a lower height were empowered to control the debate, although, unlike Rincon Hill, the Board’s decision would affect nobody but the immediate neighbors of the project. This is the historic trade-off for San Francisco. 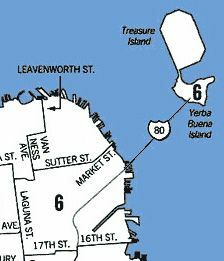 Over the past three decades the elite have been granted near exclusive power to redevelop vast stretches of the city, including SOMA, the Western Addition, Golden Gateway, and the Presidio. Now they are moving in rapid fashion to create a new employment base for upscale residents in Mission Bay, with luxury housing for newly arrived residents at Rincon Hill, and, if they get their way, Mid-Market. The political implications of this elite agenda are becoming clear. Jim Meko of the SOMA Leadership Council recently observed how all of the massive upscale development planned for Chris Daly’s district would, if approved, shift the political balance in District 6. Meko sees a risk that the thousands of new upscale voters moving to District 6 could politically align the district with a Bevan Dufty rather than electing a staunch advocate for SRO tenants and low-income residents like Chris Daly. District 6 represents the city’s most progressive district. This attempt to inject thousands of upscale voters into the district, and to disenfranchise Central City activists by redirecting all land use decisions from the Board of Supervisors to the Redevelopment Agency, is no accident. San Francisco has remained a progressive city despite sharply rising median incomes for two reasons. First, the heavy influx of lesbians and gays starting in the late 1970’s brought the city a demographic group whose progressive politics is less correlated to income than is otherwise reflective in national voting patterns. Second, San Francisco’s progressive reputation leads it to attract more progressive people; for example, no city in America has more politically progressive physicians than San Francisco. But a shift in the politics of District 6 would, as Meko suggests, replicate the process that began in the Castro in the 1980’s and that resulted in District 8 electing a strong landlord advocate in 2002 for what was thought to be a strong tenant seat. Bevan Dufty’s votes on the Board of Supervisors are much more aligned with corporate and downtown interests than are Chris Daly’s, and represent a preview of what elite forces want District 6’s Supervisor to soon become. There is a difference between a purchaser of a $2 million highrise condo and those who paid $300,000-$500,000 for one of many of SOMA’s live- work lofts. The former is far more likely to identify with Pacific Heights, and will vote for a supervisor who will move the district in that direction. Prop J was soundly defeated, and the gentrification of District 6 can still be stopped. But the line must be drawn at Mid-Market.